I first connected with Carrie Vitt last October, when she emailed me at the start of October Unprocessed. She kindly agreed to share a recipe that month (Everyday 100% Whole Wheat Bread), and we actually met in person a week or so later, at the BlogHer Food conference in San Francisco. , has just been released! Carrie sent me an advanced copy of the book (Full disclosure: It was free), and in return she asked me to write a review, which I’m happy to do, of course. Although it is primarily a cookbook, it has much more going for it than just recipes. Upon first leafing through the book, the quality is obvious: It’s filled with absolutely gorgeous photographs of foods that you wish would leap off the page and onto your plate. I’m gushing a little, but seriously, the photos are beautiful. What’s really wonderful about the book, though, is the introductory information. Although her personal story is indeed fairly persuasive, she assumes you’re already motivated to make some big changes in your life — and then she holds your hand through much of the process. Early on, she gives useful advice and recommendations for types of natural sugars, oils, whole grains, dairy, meats, and even spices and condiments. I learned and discovered a lot just from these first few pages. I had never heard of Red Palm Oil before, and I’ll definitely be adding that to our shopping list (Carrie recommends it for making popcorn, though I generally prefer to just nuke it with no oil at all.) I am also vowing to buy only organic spices from now on, since I don’t want to buy any that have been irradiated (she says manufacturers do that to increase shelf life). I should mention, however, that this isn’t what you’d think of in a traditional “health food” cookbook. 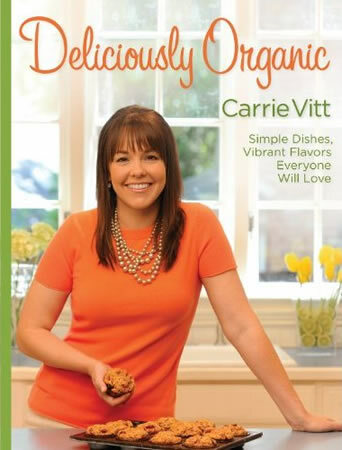 Carrie has no fear of cream, butter, oils, or sugar in most of the recipes, and she does have an entire chapter devoted to amazing-looking desserts. She’s clearly not focused on calories as much as she is whole foods. I’m fine with that: As a self-proclaimed healthy foodie, I believe we can — and should — look for both “health food” and “delicious food,” and then focus on the intersection of the two. With her new book, Carrie’s done just that. Available in Harcover at Amazon, $35.00.